Base isolation, also known as seismic base isolation or base isolation system, is one of the most popular means of protecting a structure against earthquake forces. It is a collection of structural elements which should substantially decouple a superstructure from its substructure resting on a shaking ground thus protecting a building or non-building structure's integrity. Base isolation is one of the most powerful tools of earthquake engineering pertaining to the passive structural vibration control technologies. It is meant to enable a building or non-building structure to survive a potentially devastating seismic impact through a proper initial design or subsequent modifications. In some cases, application of base isolation can raise both a structure's seismic performance and its seismic sustainability considerably. 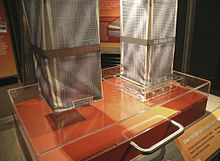 Contrary to popular belief base isolation does not make a building earthquake proof. Isolation units are the basic elements of a base isolation system which are intended to provide the aforementioned decoupling effect to a building or non-building structure. Isolation units could consist of shear or sliding units. This technology can be used for both new structural design and seismic retrofit. In process of seismic retrofit, some of the most prominent U.S. monuments, e.g. 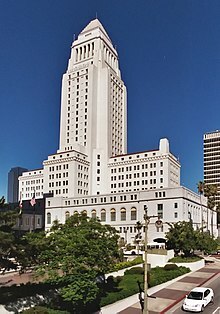 Pasadena City Hall, San Francisco City Hall, Salt Lake City and County Building or LA City Hall were mounted on base isolation systems. It required creating rigidity diaphragms and moats around the buildings, as well as making provisions against overturning and P-Delta Effect. Base isolation is also used on a smaller scale—sometimes down to a single room in a building. Isolated raised-floor systems are used to safeguard essential equipment against earthquakes. The technique has been incorporated to protect statues and other works of art—see, for instance, Rodin's Gates of Hell at the National Museum of Western Art in Tokyo's Ueno Park. Through the George E. Brown, Jr. Network for Earthquake Engineering Simulation (NEES), researchers are studying the performance of base isolation systems. The project, a collaboration among researchers at University of Nevada, Reno; University of California, Berkeley; University of Wisconsin, Green Bay; and the University at Buffalo is conducting a strategic assessment of the economic, technical, and procedural barriers to the widespread adoption of seismic isolation in the United States. NEES resources have been used for experimental and numerical simulation, data mining, networking and collaboration to understand the complex interrelationship among the factors controlling the overall performance of an isolated structural system. This project involves earthquake shaking table and hybrid tests at the NEES experimental facilities at the University of California, Berkeley, and the University at Buffalo, aimed at understanding ultimate performance limits to examine the propagation of local isolation failures (e.g., bumping against stops, bearing failures, uplift) to the system level response. These tests will include a full-scale, three-dimensional test of an isolated 5-story steel building on the E-Defense shake table in Miki, Hyogo, Japan. An adaptive base isolation system includes a tunable isolator that can adjust its properties based on the input to minimize the transferred vibration. Magnetorheological fluid dampers and isolators with Magnetorheological elastomer have been suggested as adaptive base isolators. Wikimedia Commons has media related to Base isolation. ^ "Los Angeles City Hall Seismic Rehabilitation Project – Base Isolation Technology". Archived from the original on 27 July 2011. ^ "Nabih Youssef Associates | Structural Engineers". www.nyase.com. Retrieved 2017-06-11. ^ Pressman, Andy (2007). Architectural Graphic Standards. John Wiley and Sons. p. 30. ISBN 978-0-471-70091-3. ^ Webster, Anthony C. (1994). Technological Advance in Japanese Building Design and Construction. American Society of Civil Engineers. p. 70. ISBN 978-0-87262-932-5. ^ Datta, T. K. (2010). Seismic Analysis of Structures. John Wiley and Sons. p. 369. ISBN 978-0-470-82462-7. ^ Reitherman, Robert (2012). Earthquakes and Engineers: An International History. Reston, VA: ASCE Press. ISBN 9780784410622. ^ Giovannardi, Fausto; Guisasola, Adriana (2013). "Base isolation: dalle origini ai giorni nostri". Retrieved October 7, 2013. ^ Yang, G.; Spencer, B.F.; Carlson, J.D. ; Sain, M.K. (March 2002). "Large-scale MR fluid dampers: modeling and dynamic performance considerations". Engineering Structures. 24 (3): 309–323. doi:10.1016/S0141-0296(01)00097-9. ^ Behrooz, Majid; Wang, Xiaojie; Gordaninejad, Faramarz (1 April 2014). "Performance of a new magnetorheological elastomer isolation system". Smart Materials and Structures. 23 (4): 045014. doi:10.1088/0964-1726/23/4/045014.